Last year it was brought to my attention that our supporters section created a shirt for me. Am I happy about it? Yes, I am, but it is funny in a way because it is almost sacrilegious. haha. I mean, I definitely am a supporter of the Big Man upstairs, my homeboy JC. Which makes it a little more weird for me, because being on the same cross He died for us on... I am very honored by the fans for it, but I am definitely not worthy. I know it is all a big compliment and I thank you all. Now all we got to do is start some kind of tradition between me and the fans, but we will get to that later. Now getting to what recently has been brought to my attention and that is this year's shirt they made for me. Now, this year's shirt rocks. It is graphically well done. I mean the picture on it actually looks exactly like me and it is a clever slogan. I applaud whoever did this year's version. Both pictures are below. The only thing is that this graphic implies, I think, that I am fast. Now, that is cool because I never have envisioned myself as fast, I mean I can hold my own, but if people view me as fast that is exciting for me. To break it down for you, my dream is to have a super power and that power would be super-duper speed. I could run across water, I would have super keen senses because my mind would have to keep up with my speed, my body would be extra durable because my body would have to withstand super-duper speed. Sooooooo, back to reality. I appreciate the shirt. Now, I will start our Crew fans off and friends of mine with a suggestion and if you read this send a suggestion of your own and we will all decide on which tradition I will do before, after and during games for one fan or them all. For my suggestion I propose that someone, only one person, can buy me a medium in one of these two shirts and send it to our training facility, I will provide you with the address. I will sign it and write a special message to them on the shirt and wear it under my jersey during the game. Then after the game we will have a specific place for you to be so I can come over and take off the shirt and give it back to you with it signed, worn, and a special message of my own to you. Have someone buy a shirt, THEY write a message for YOU on the shirt and send it to you. You wear it under your jersey for a game, plan a meet up after the game where you give them your jersey in which you can sign/have a message on. My name’s Justin, and I’m the guy who designed the new "Only Columbus has him!" t-shirt that’s on Skreened. I can’t tell you how happy I am that you like it. My sister Jenny and I do graphic design, and one of our habits has become coming up with (hopefully clever) tribute t-shirts to the Crew and you guys on the team. Sounds like a blast, I know, but we have a fun time doing it, and it helps us pass the down time and keep up the spirit in the off-season, and hopefully does some good promoting the team. Honestly, this whole thing is too funny. The other day, I read on one of the supporters’ message boards that you and Danny O’Rourke had talked on the Short Corner podcast about the CBA and how that was all going down. So I checked it out on iTunes and was sitting at my computer listening to it while I was working on something. All of sudden, I hear Jared start talking to you about the shirt. Man, the earbuds just about popped out of my ears. I right away emailed my sis, and we were both amazed that someone told you about it. Our minds were kind of blown. Then, she called me a couple hours later and told me that she checked your blog, and that you had written about it on here. Needless to say, we’re really excited that you want to start a tradition with the fans for this year using the shirt. I really like the idea that you proposed. And I was thinking that maybe we could do something for Filleo with it, as well. Basically, whenever someone orders one of the shirts we designed, Skreened puts 3 dollars into our store’s account. So what about this for an idea: hopefully more than enough fans will take you up on your idea, and when we sell enough shirts to have enough money in our account to buy another shirt, we’ll use that money to buy one and donate it or to Filleo (or we could just donate that money to Filleo, whatever would be preferable). Designing the shirt and putting it on Skreened was never really about making money for us—it was about making a cool shirt that will promote the team—so this would be a perfect way to use that money for a good cause. And I’ll definitely take you up on your game-worn shirt idea! And again, we’re really glad you like it. I believe the players are limited on the number of jerseys they can give away after the games, due to a cost thing. Some of the guys make enough money that they will do it anyways (e.g. Frankie) for the fan experience. I think the T-shirts would be better from a game-to-game standpoint. 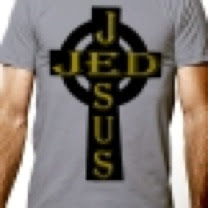 Perhaps Jed could do some kind of contest though occassionally for a jersey, perhaps associated with his charity work? Jed, what do you think about getting some other guys on the team and doing a pre-game prayer in the Nordecke corner, perhaps just before you guys head back in to the lockerroom after warm-ups? I don't know if that would offend some people or not, but if it is after warm-ups, you won't have all the crazies in the section yet. I don't have any specific ideas, but I also think it would be cool if there was more done with the rock at the tunnel in some sort of tradition. Maybe there is a little something when you guys enter the field, but I've been unable to see it from my place in the Nordecke. My understanding is that the rock has a connection to Lamar Hunt, so maybe something that would honor his memory each game would be cool.